Although we once again had to deal with warm temperatures, the sculptors did a tremendous job in dealing with these challenging conditions and creating spectacular works of art. Unfortunately, the sculptures were gone far too soon but heavy traffic on Friday and Saturday helped us reach the impressive number of over 22,000 spectators. And we had a very good year in regard to community support with over $7,000 from our 19 block sponsors and an $8,000 grant from the Community Foundation of Northern Illinois. This was in addition to the $21,000 in donated products and services we received from our many in-kind donors and supporters. We continue to increasingly utilize social media to promote this event and it certainly gets a lot of attention. One video posted on Facebook received over 2,100 views. On Instagram, we had 624 Likes over 14 Posts. And for the first time, we created a Snapchat Filter that had 9,628 Views. I'm not exactly sure what all of this means but our marketing people say it's pretty good. 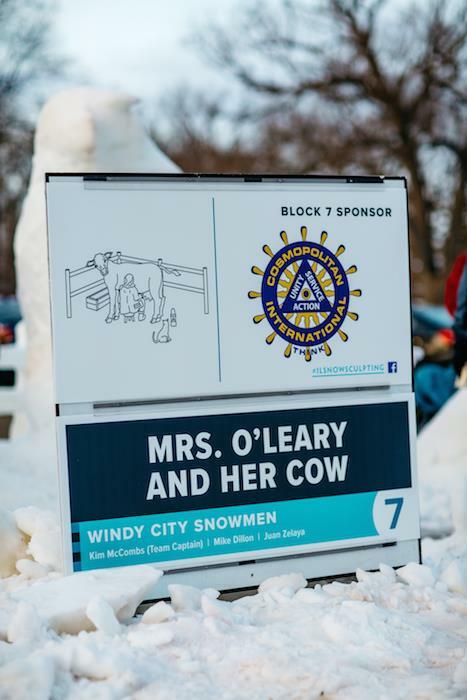 The Illinois Snow Sculpting Competition is sanctioned by the US National Snow Sculpting Competition and the winner of our event goes on to represent our state in the National Competition in Lake Geneva where they compete against other state winners. This year, Cave People from Space, comprised of Capt. Brian Hierstein, Joe Goral and Kelly Madison took first place in the Illinois Competition with their sculpture “So Long and Thanks for All the Fish”. They will represent Illinois next February in Lake Geneva. The Rockford Park District is honored to be able to provide this event to our community each year and we are grateful for the many partners like you that help us. Without your help, there would be no way that we could continue offering this unique event to the City of Rockford. Thanks again and best wishes throughout the rest of this year.